Participants in our DiA Leading People program often grapple with the challenge of coaching their teams. ‘I still seem to be the one coming up with all the answers’. ‘I have told them this over and over again but nothing is changing’. One of the best ways for leaders to address these sort of issues is to apply a coaching approach to many of their interactions. We have many resources to help leaders build and enhance these skills! Coaching is one of the most powerful skills a leader can master, and for this reason we regularly write about! The ties between the leader’s coaching skills and employee engagement levels are mind blowing! Click here to see all the blogs we have written on coaching. Many of our DiA alumni have printed this out and stuck it up in their work area! 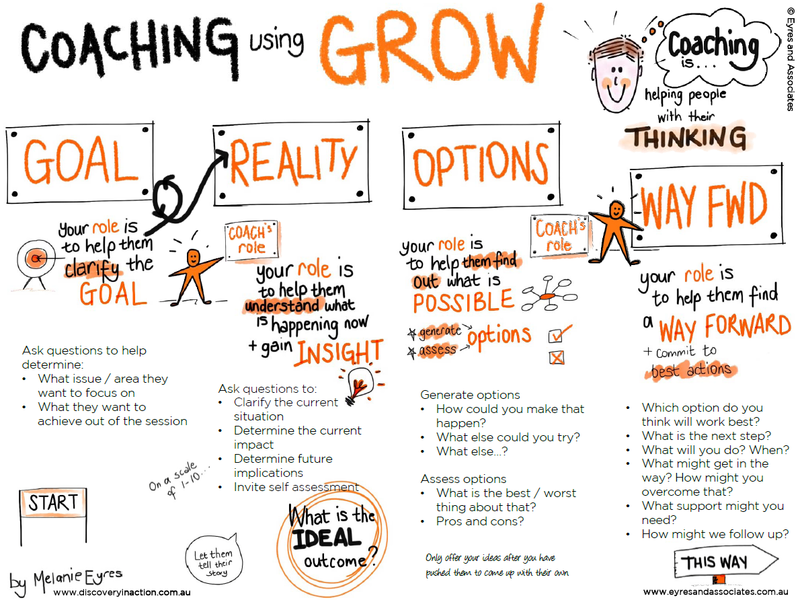 Click here to access PDF version of the GROW visual. Want to further improve your coaching skills? If you are interested in exploring coaching further, you may be interested to know that we provide skills development workshops in the area of Coaching. If you’d like to find out more – click here.